At Salendine Nook we strongly believe that all pupils should be attaining at the highest level at which they are capable. They should have experiences and support to enable them to grow into well rounded, successful and confident adults. Our expectations of their achievement and behaviour should be as high as for non-disadvantaged pupils. The Pupil Premium is a government initiative that injects extra cash into schools according to the number of disadvantaged pupils in the school. The government has used entitlement to Free School Meals (FSM), children who are looked after (CLA) and children of Service Personnel as indicators of deprivation or need. They have provided a fixed amount of money for schools per pupil based on the number of pupils eligible. Children who have been adopted from authority care since 2005 are also eligible for funding. Pupil Premium Funding is not intended to be ‘ring-fenced’ and spent on a particular mchild but rather to be used to narrow the gap in attainment of this group as a whole mby investing in successful strategies. Although there is evidence for a gap in attainment between Disadvantaged and Non- Disadvantaged, the reasons for this mare complex and often subtle. Thus there is no ‘one size fits all’ solution to solving mthese challenges. Staff believe in all children and have the highest expectation of achievement and behaviour regardless of whether pupils are Disadvantaged or not. There are no excuses made for underperformance against the pupils’ targets based on their ability. There is a ‘solution based’ approach to overcoming barriers to learning and behaviour. Pupils are supported to develop high but realistic expectations of what they can achieve both academically and in personal growth. Underachievement at all levels will be targeted. The government requires us to track the achievement of disadvantaged pupils against other students to ensure that strategies we invest in have an impact on ‘narrowing the gap’ between the two groups. We will use data in order to remain aware of how all pupils are doing against their targets. We will use data to evaluate strategies invested in to ensure they have a positive impact on the achievement of disadvantaged pupils. All teaching staff and support staff are aware of who their disadvantaged pupils are. All disadvantaged pupils will benefit in some way from funding. Pupils individual needs are considered so that funding is carefully targeted at their needs. 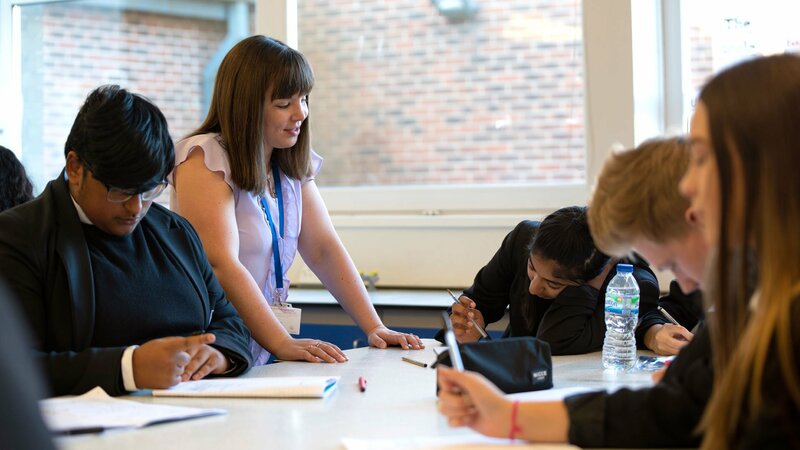 We will continue our efforts to ensure that all pupils receive good or outstanding teaching. There will be increased emphasis on ensuring that the disadvantaged pupils in class are not falling behind their targets. In class support from ETAs, Learning Mentors and SEN staff will continue and be expanded if possible. Staff will look at the individual needs of pupils and may seek additional support to help overcome and barriers to learning they identify. Good practise within the school will be shared and we will draw on external expertise where necessary and available. Attendance and punctuality of disadvantaged pupils will be carefully monitored and any shortfalls addressed. Student Support Managers will be deployed to support behaviour and attendance improvement strategies with targeted PP students. There will be additional support to overcome barriers to learning due to literacy weaknesses in the form of an adult reader scheme. Pupils who are identified as underachieving against their targets will be allocated time with a learning mentor who will address their individual needs. There will be additional support for disadvantaged pupils in times of crisis. Pupils whose behaviour in class or out reduces their ability to succeed will receive additional support from the Student Support Centre. There will be increased support in ‘homework club’ which runs after school for an hour every day to ensure that all pupils have access to the help, advice and practical necessities such as internet access, printing, software or art materials necessary to do their homework and revision. There will be a breakfast club running from 8.15 am where pupils will have access to computer facilities and learning mentors. This will provide facilities for supported self-study. The library and Silent Study room will extend this support at lunchtime. Lunchtime Revision Sessions and After School Catch-Up and revision will continue to provide high quality support and tuition especially in the GCSE years and ensure all pupils have the opportunity to complete work and revise well. Easter and half term revision classes will also continue to be run to expand the opportunities for high quality learning. All disadvantaged pupils whose target grades suggest they could be capable of accessing Higher Education will receive input to ensure they are aware of their choices and are able to make a fully informed decision about their future. A Pupil Premium Review has taken place in June 2018. This report is available upon request. It has been used to write a new Pupil Premium Strategy. This is also available upon request. Finally, £50,000 of new money has been ring-fenced to support the PP Strategy for 2018-19. Anonymised case studies will evaluate to impact of spending on individual pupils. There will be an evaluation of the progress of disadvantaged pupils at RAG meetings(Raising Achievement Group). A designated team will monitor how Pupil Premium money is spent within the school. A named governor will undertake to oversee the support of disadvantaged students within the school. An overview of the spending of the allocated money will be produce each year and publicised on the school website.